"Raw, clear british crunch, classic heavy metal, modern high gain or anything in between – the Dominator easily does the job. This box has nothing in common with those overcompressed, artificial sounding "bedroom metal" distortion pedals that disappear in the mix if you try to use them in a real band situation. Raw natural gain structure, explosive attack, tight low end and great chord definition make the difference – the Dominator works equally well at home practice or stage level. The active 3-band EQ with switchable mid range frequency provides effective and intuitive control over a broad range of sounds. A new feature in the Dominator MKII is an internal noise gate, controlled by a 3-position-switch. (For extensive descriptions of the controls please refer to the user manual). 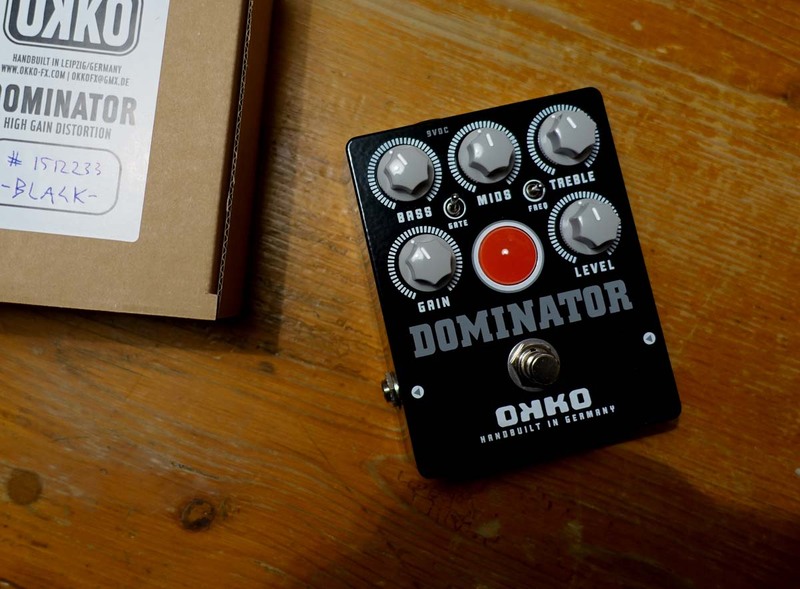 Just like the other OKKO drive pedals, the Dominator features an internal voltage doubler. The three gain stages and the EQ stage operate on different individually filtered voltages up to 18 volts for optimal dynamic response and very low noise performance. The Dominator works best in front of a clean amp with some headroom, especially if you use very bass heavy settings."